During 2010–2014, an estimated 8.2 million induced abortions occurred each year in Africa. This number represents an increase from 4.6 million annually during 1990–1994, mainly because of an increase in the number of women of reproductive age. The annual rate of abortion for the region is an estimated 34 per 1,000 women of reproductive age (15–44), and remained more or less constant between 1990–1994 and 2010–2014. As of 2010–2014, the annual abortion rate varies slightly by subregion, ranging from 31 per 1,000 women of reproductive age in Western Africa to 38 per 1,000 in Northern Africa; rates in Eastern, Middle and Southern Africa are close to the regional average of 34 per 1,000. 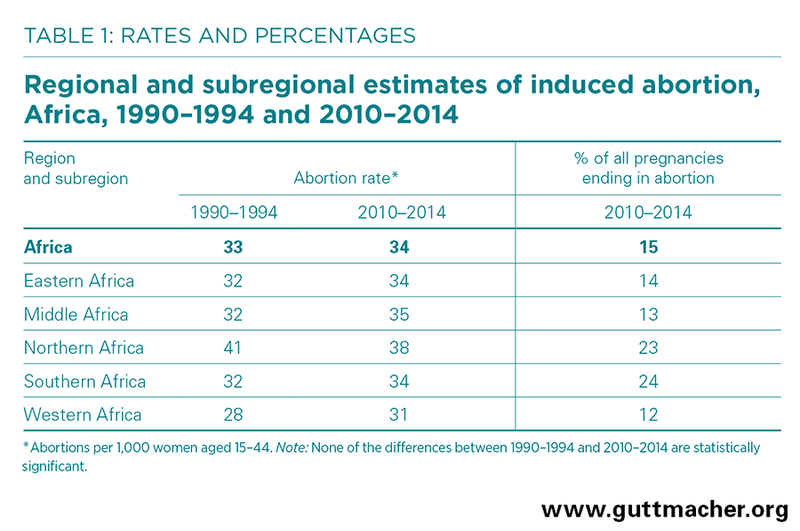 The proportion of pregnancies ending in abortion ranges from 12% in Western Africa to 24% in Southern Africa; rates in Middle, Eastern and Northern Africa are 13%, 14% and 23%, respectively. Abortion is not permitted for any reason in 10 out of 54 African countries. 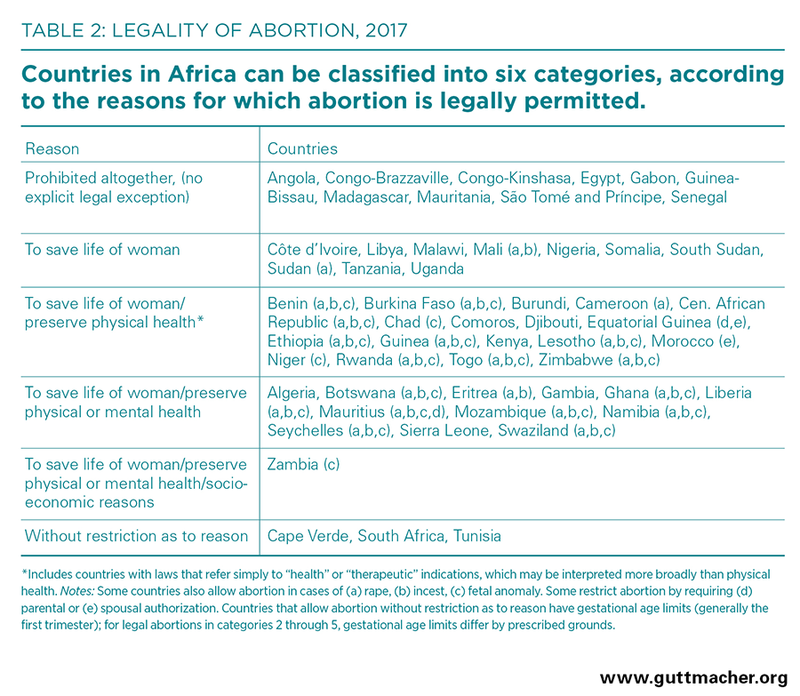 Four countries in Africa have relatively liberal abortion laws: Zambia permits abortion for health and socioeconomic reasons, whereas Cape Verde, South Africa and Tunisia permit abortion without restriction as to reason, with gestational limits. Induced abortion is medically safe when WHO-recommended methods are used by trained persons, less safe when only one of those two criteria is met, and least safe when neither is met. Many women in Africa undergo unsafe (i.e., less safe or least safe) procedures that put their well-being at risk. During 2010–2014, an average of about one in four abortions in Africa were safe. Of those that were unsafe, the majority fell into the least-safe category. The poorest women with the fewest resources are the most likely to experience complications from unsafe abortion. Unsafe abortion has negative consequences beyond its immediate effects on individual women’s health. Treating complications increases the economic burden on poor families and incurs considerable costs to already struggling public health systems. Most women who have an abortion do so because they become pregnant when they do not intend to. As of 2010–2014, the unintended pregnancy rate in Africa as a whole is 89 per 1,000 women aged 15–44; in Eastern Africa, the rate is 112 per 1,000 women. An estimated 21.6 million unintended pregnancies occur each year in Africa; of these, nearly four in 10 (38%) end in abortion. The grounds for legal abortion in the region should be broadened and access to safe abortion services improved to reduce the number of clandestine procedures and the negative consequences that often result. Liberal abortion laws alone do not ensure the safety of abortions. Service provision guidelines must be adopted and disseminated, providers must be trained, and governments must be committed to ensuring that safe abortions are available. 6. Guttmacher Institute, Adding it up: investing in contraception and maternal and newborn health, 2017, Fact Sheet, New York: Guttmacher Institute, 2017.